Diego Rivera is widely regarded as the greatest Mexican painter of the twentieth century. His large-scale, public murals expressed his Marxist politics—a strong commitment to workers’ rights and an abiding interest in the history of human progress and technology. His work drew widespread acclaim, if also sometimes controversy, and helped establish Rivera as an international celebrity in the 1930s and ’40s. Rivera was born in Guanajuato, Mexico, in 1886 and began painting at an early age. He moved to Paris by the time he was 21 where he learned to integrate Cubism with traditional, Mexican symbolism. When he returned to Mexico in 1922, the country was just emerging from the Mexican Revolution (1910–1920). The conflict had lasted 10 years, caused the death of over a million people, and resulted in the overthrow of Mexico’s ruling elite. Rivera collaborated with artists, writers, and officials in the new socialist government to promote post-Revolutionary Mexican culture and national identity. Rivera revived the art of fresco painting, creating monumental murals that depicted heroic scenes from Mexico’s history. It mattered to him that his art was public and readily accessible to a wide audience who might not enter museums or galleries. In the 1930s, Rivera received commissions to create murals across the United States. He traveled with his wife, Frida Kahlo, a celebrated painter in her own right. Rivera attracted controversy, but also inspired political leaders, such as President Franklin Delano Roosevelt, to promote art and culture during the New Deal. While primarily known for his murals, Rivera was also an accomplished printmaker. Supporters of the Mexican Revolution recognized the power of print to reach a mass audience; they created workshops where artists such as Rivera, José Clemente Orozco, and David Alfaro Siqueiros could collaborate. 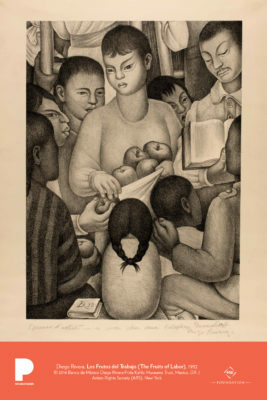 Los Frutos del Trabajo (The Fruits of Labor) is one of a series of prints published by the Weyhe Gallery in New York City whose goal was to make Rivera’s work more widely available to collectors in North America. It is a detail from the mural The Rural School, which Rivera painted on the Ministry of Education Building in Mexico City in 1926. The inscription at the bottom reads in French: Epreuve d’artiste–à mon cher ami Estephan Dimitroff. Diego Rivera (“Artist’s proof—to my dear friend Stephen Dimitroff”). Dimitroff and his wife, the artist Lucienne Bloch, both studied and worked with Rivera. They donated this print to the Portland Art Museum. Rivera died in Mexico City in 1957. Cubism was a revolutionary new approach to representing reality invented in around 1907/08 by artists Pablo Picasso and Georges Braque who aimed to bring different views of subjects (usually objects or figures) together in the same picture, resulting in paintings that appear fragmented and abstracted. Fresco is a mural painting technique that involves painting with water-based paint directly onto wet plaster so that the paint becomes an integral part of the plaster. Developed in Italy from about the thirteenth century, fresco was perfected during the Renaissance. Lithography is a printing process that works on the principle that oil and water repel each other. The artist draws on a flat stone or metal plate using a greasy substance so that the ink will adhere to them, while the non-image areas are made ink-repellent. Count how many figures you see in the composition. Describe their expressions and how they interact. What do you think their relationships are with one another? What objects do you notice in this image? Why did Rivera include these objects? What is their symbolic value? Shape is an important element of art in Rivera’s work. Take one minute to create a quick sketch of Rivera’s print, focusing on the outlines of figures and objects. What shapes do you observe? The title of this print is The Fruits of Labor (Los Frutos del Trabajo). What do you think Rivera meant by this title? Does the title have more than one meaning? Using a viewfinder (see instructions below), try framing different parts of Rivera’s composition. Focus your viewfinder on the faces and hands of the figures, or the fabric and fruit, for example. What happens when you focus on just one area of the print? How does using a viewfinder change how you view the overall composition?